This lithograph is taken from plate 3 of 'Afghaunistan' by Lieutenant James Rattray. 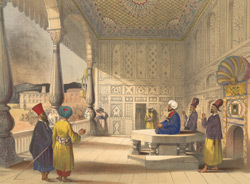 This scene shows Shah Shuja in 1839 after his enthronement as Emir of Afghanistan in the Bala Hissar (fort) of Kabul. Rattray wrote: "The Shah was a man of great personal beauty, and so well got up, that none could have guessed his age." He continued: "the wild grandeur of the whole pageantry baffles description." The population watched Shuja's grand entry in absolute silence. He was then seated on a white and reputedly ancient marble throne. From here he could be seen by the court in the quadrangle below. The wooden arches and pillars surrounding him were carved and painted and the ceiling richly decorated. A year later the sanctity of the scene was bloodily violated: Shah Shuja was murdered and "the sacred throne, [became] a lounge, a pitch-and-toss table."